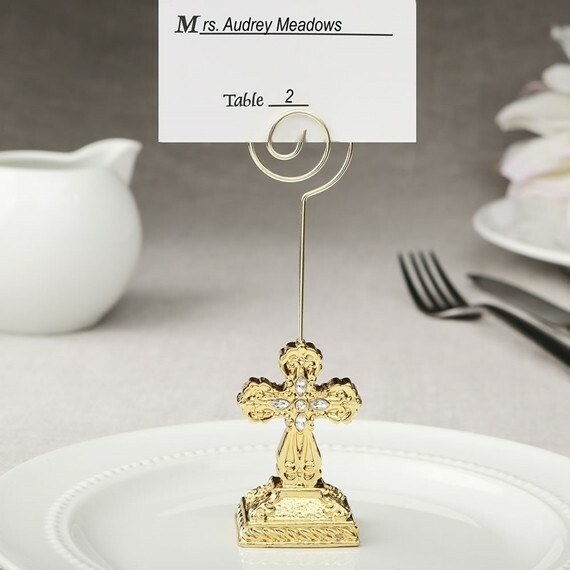 This Christian-themed placecard holder features a gold-colored cross standing on an intricately carved base. The Cross and base are finished in a magnificent metallic gold plating. To accent the design there are four (4) clear rhinestones in the center of the cross, which has a gold metal wire attached with a coiled top for easy insertion of a placecard or photo. A blank placecard is included. Sold individually. Bulk-packed.